Isoquinolines are very significant due to their derivatives. A large proportion of which is alkaloids, show helpful biological effects. Certainly, the medicinal properties of the plants that biosynthesize such alkaloids have been recognized for centuries, long before the nature of the compounds responsible was known. Papaverine and morphine are found in the latex from poppy seed capsules. Papaverine is a vasodilator whereas morphine is the analgesic agent. Antihypertensive agents like quinalapril, debrisoquine and quinalaprilat all have the isoquinoline ring system. Papaverine is the opium alkaloid which is a vasodilator employed mainly in the treatment of visceral spasm, vasospasm (particularly those comprising the heart and brain) and occasionally in the treatment of erectile dysfunction. As both are found in the opium poppy, papaverine differs in both structure and pharmacological action from the analgesic (that is, morphine-related) opium alkaloids (or opioids). Morphine (MS Contin, MSIR, Avinza, Kadian, Oramorph and Roxanol). Morphine is basically a benzylisoquinoline alkaloid having two additional ring closures. This is a potent opiate analgesic medication and is considered to be the prototypical opioid. This was first isolated in the year 1804 by Friedrich Serturner, first distributed by similar in the year 1817, and first commercially sold by Merck in the year 1827, which at the time was a single small chemists' shop. This was more broadly employed after the invention of the hypodermic needle in the year 1857. It took its name from the Greek god of dreams, Morpheus. Morphine is the most plentiful alkaloid found in opium, the dried sap (latex) derived from shallowly slicing the unripe seedpods of the opium, or general edible, poppy, Papaver somniferum. 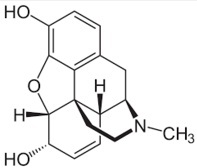 Morphine was the first active principle purified from the plant source and is one of at least 50 alkaloids of several different kinds present in opium, Poppy Straw Concentrate and other poppy derivatives. In the clinical medicine, morphine is considered as the gold standard, or benchmark, of analgesics employed to relieve severe or agonising pain and suffering. Similar to other opioids, like oxycodone, hydromorphone and diacetylmorphine (heroin), morphine acts directly on the central nervous system (CNS) to relieve pain. Dissimilar most of other opioids, morphine is an opiate and a natural product. Morphine consists of a high potential for addiction; tolerance and psychological dependence develop rapidly, however physiological dependence might take several months to develop. a) Anesthetics; dimethisoquine is one illustration (figure shown below). b) Antihypertension agents, like quinapril, quinapirilat and debrisoquine (all derived from 1,2,3,4-tetrahydroisoquinoline). c) Antifungal agents, like 2,2'-Hexadecamethylenediisoquinolinium dichloride, which is as well employed as a topical antiseptic. This derivative is made up by N-alkylation of isoquinoline by the suitable dihalide. d) Disinfectants, such as N-laurylisoquinolinium bromide, which is made up by simple N-alkylation of isoquinoline. 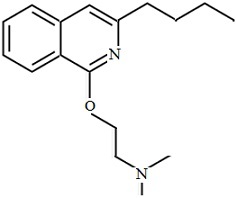 Bisbenzylisoquinolinium compounds are the compounds identical in structure to tubocurarine. They encompass two isoquinolinium structures, linked through a carbon chain, having two ester linkages. Parkinson's disease, a slowly progressing movement disorder, is thought to be caused via some neurotoxins. A neurotoxin termed as MPTP (1[N]-methyl-4-phenyl-1,2,3,6-tetrahydropyridine), the precursor to MPP+, was found and associated to Parkinson's disease in the year 1980. The active neurotoxins destroy dopaminergic neurons, leading to the Parkinsonism and Parkinson's disease. Some of the tetrahydroisoquinoline derivatives have been found to encompass the similar Neurochemical properties as MPTP. 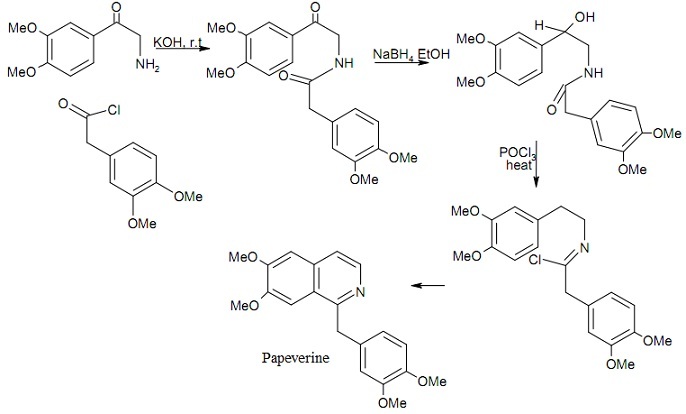 These derivatives might act as neurotoxin precursors to active neurotoxins. Isoquinolines are employed in the preparation of dyes, paints, insecticides and antifungals. It is as well employed as a solvent for the extraction of resins and terpenes and as a corrosion inhibitor.